Tuscany, Italy has some of the most breathtaking landscapes in the world, and it's not hard to see why it attracts people from around the world. The fertile fields and valleys south of the Renaissance capital of Florence hold countless surprises for its visitors. There are regions you'd never guess were Tuscany - like the Garfagnana region north of Pisa bordered by alpine mountains, or the Maremma where you'll find caves carved by the early Etruscans out of Tufa stone. There are even rice fields in the land of Chianti and Brunello di Montalcino. But given its sizable region (over 8,875 square miles), it’s telling that so many tourists come to see the same small valley south of Siena to leisurely drive the iconic countryside. Taking a Tuscany road trip is on many travelers’ bucket lists, a testament to its rare beauty. The patchwork of rolling wheat fields, verdant green forests and narrow, cypress lined roads with earthy stone farmhouses dotting the quilt like buttons is just such a classic scene. It mesmerizes, inviting a glass of wine, a nibble of cheese, and nothing else but a wondrous gaze. It's so iconic in fact, UNESCO (United Nations Educational, Scientific and Cultural Organization) has bestowed status not once, but seven times upon the region, including the swath of valley that defines the landscape of Tuscany - the Val d'Orcia. Tuscany’s landscape is unique in Europe. Some regions might come close with stunning vineyards like the south of France, the Istrian peninsula of Croatia, or south Styrian Austria. But it’s still not Tuscany. The Valley of Orcia, stretching between the Orcia River south of Siena and the border between Siena and Grosseto, begs to be explored slowly. But how do you know where to go without getting so off the beaten path it ruins your day and maybe your whole vacation? Check out our three scenic drives. 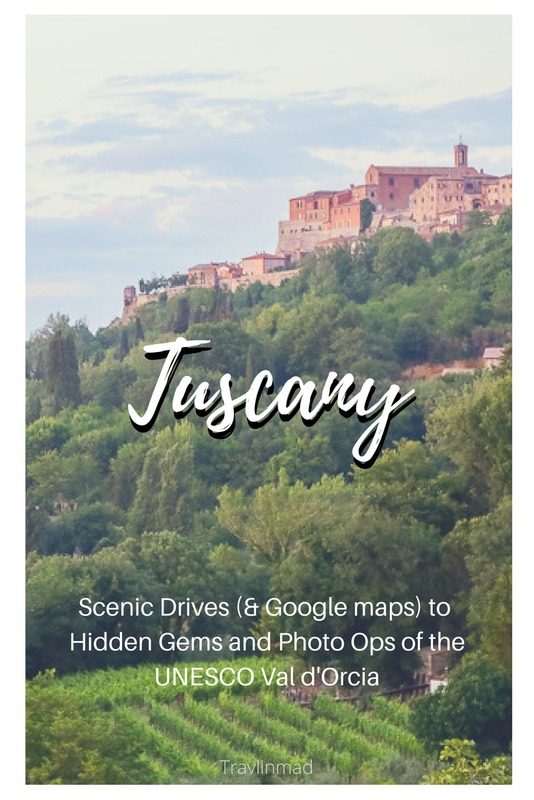 The Google maps can be shared to your smartphone to guide you around the routes and to the many hidden gems and great photo spots you need to see in Tuscany. Driving on your own in Tuscany can be a bit tricky for visitors but once you get used to the traffic signs, speed traps, and understand the difference between SP (Strada Provinciale - a secondary road) and SR (Strada Regionale - or highway) you'll be fine. Our BEST TIP for renting a car in Tuscany: Get the GPS or bring one from home! Of the many scenic drives in the region, we chose three routes with the iconic views you've always wanted to see. Two routes begin in San Quirico d'Orcia and one in Montepulciano. While Montepulciano is technically in the Val di Chiana rather than the Val d'Orcia, it's close to San Quirico and Pienza, and shouldn't be missed. 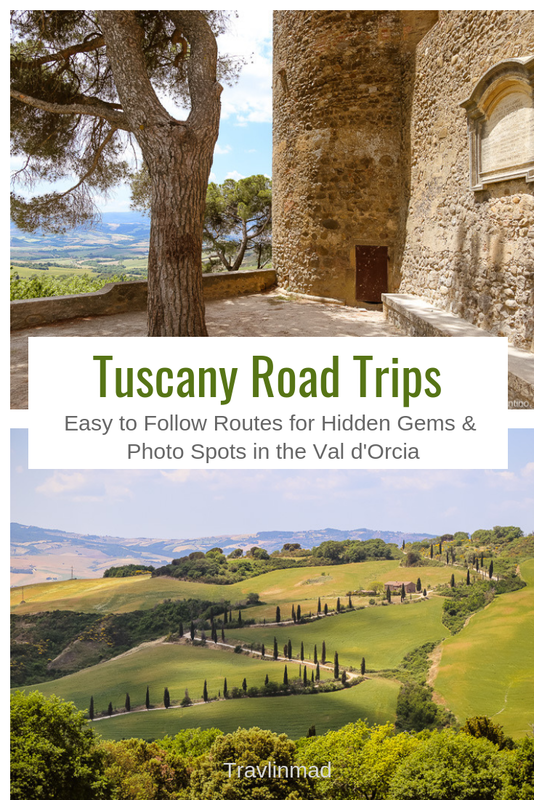 All of these Tuscany scenic drives include interactive Google maps to share on your phone or GPS. Finally, if this is your first trip to Tuscany, don’t be afraid to get out and explore - and even get lost. People here are so friendly and will help get you back on track. It’s all part of the adventure. Buon viaggio! This route begins in the town of San Quirico d'Orcia and ends in Montepulciano. The first time we drove through Tuscany, we spent every day driving this stretch of highway between these three towns. It's easy to follow the traffic and miss a lot of the smaller sights so take it slow and stop often. DRIVE: From San Quirico, take SP146 toward Pienza. SEE: Between San Quirico and Pienza, there are several interesting Tuscany landmarks to see, especially for photographers. A few klicks out of town on your left is a large iron gate that hides the remains of an overgrown long driveway leading to a beautiful villa at the top of a hill. Directly across the road it gets even better. Park your car and look out over the sheep barn to see the famous Podere Belvidere in the distance, a villa that happened to grace the cover of my Fodors guidebook. 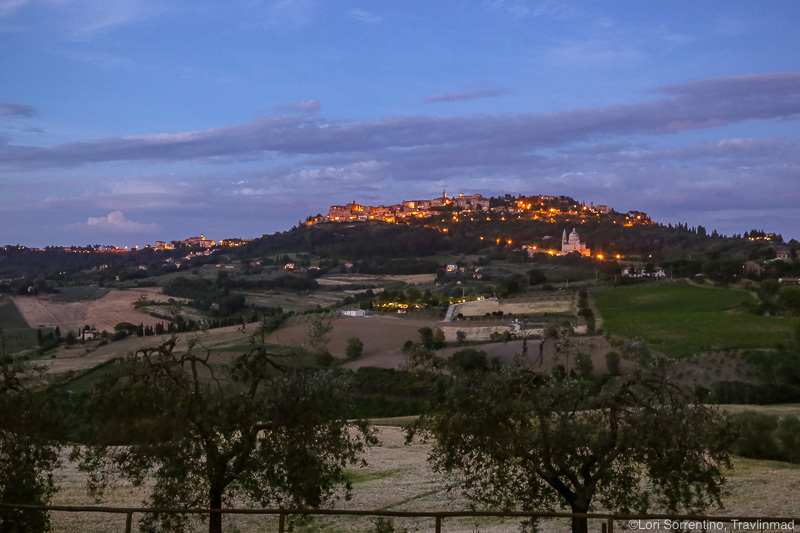 When I found out where it was, and that it was accessible to photograph from a distance, we got up at 4:00am to drive from our hotel in San Gimignano to photograph it at sunrise... twice. I took this photograph (below) as the light was warming, after waiting a while in the dark. Little did we know there were sheep just below where our tripod was set up. The farmer startled us a bit when he came out to feed them (or maybe it was the other way around) but he just smiled and waved. PHOTO TIP: If you want to photograph Podere Belvidere at sunrise, park your car in the small parking area along the main road and walk down through the orchard trees to find the best view. This photo of Podere Belvidere (below) was taken from another angle from further down the lane off SR146. Just past Podere Belvidere, off in the diatance to your right is the famous Chapel of Madonna of Vitaleta. The Madonna that originally graced this little chapel built during the Renaissance was moved to San Quirico d'Orcia and you can see her today in the Church of San Francesco. PHOTO TIP: You can photograph the chapel from the main road (SR146, as I did below). To get closer, take the side road. Coming from San Quirico, the road is marked with a Capella di Vitaleta sign on your left. From the junction where you leave your car it's a 10 minute walk to the chapel. DRIVE: Continue driving on SP146 to the town of Pienza. SEE: Would you believe our first drive through Pienza made us think there was nothing much here? SP146 leads you through a corner of Pienza past a few local hotels and some underwhelming structures built in the 1950s, then heads back out of town. But don't be fooled. Follow the SP146 further into town looping back around. Pienza is one of Tuscany's treasured towns, made this way after one of its most illustrious citizens, Enea Silvio Piccolomini, who became Pope Pius II in 1458. Naturally, he ensured that his birthplace got lots of love and attention, adding layers of Renaissance aesthetics. Also constructed was a stunning trapezoidal piazza, a cathedral by Bernardo Rossellino, and the elegant Palazzo Borgia and Palazzo Piccolomini. Spend an hour or more exploring the town. DRIVE: Continue along SP146 toward Montepulciano. SEE: Coming into Montepulciano, look for a sign for Cugusi Silvana dairy farm (GPS: 43 ° 06'03.2 "N, 11 ° 45'15.0" E), an excellent place to stop for some wine and a bite of their award-winning pecorino cheese, one of Italy's most authentic regional foods. The driveway is a hard left turn off the main road so go slow. After the turn, take the dirt road all the way down to the parking lot. If you're lucky - like we were - you'll see (or hear) their herd of Tuscan sheep with bells tinkling. Afterward, if you're looking for a great place for dinner, we recommend La Grotta in Montepulciano. The food is delicious, and it's in a great location just behind the landmark Church of San Biagio, making it a perfect place for photo ops too. PHOTO TIP: Time your evening so you can enjoy and finish dinner just before sunset. I took this photo of the church while my family was still finishing their dessert, but I knew I wanted to get the light from the sunset on the church. It was so worth walking off my dinner! Start this Loop route in San Quirico d'Orcia. San Quirico d'Orcia sits high on a hill between Pienza and Montalcino. As you come into town, you might recognize a cluster of cypress trees that stand like sentinels on the hill. It's an iconic photo op, and while you'll see many more of these trees as you travel around, this cluster literally stands alone. The town was an important stop in Medieval times for it's location along the Via Francigena, the pilgrimage route which connected northern Europe to Rome. Most of San Quirico’s fortified walls are still standing, and cars are not allowed inside. So leave your car outside the city walls and walk from there. One of the most interesting sites to see is the gardens at the Horti Leonini. DRIVE: Drive south from San Quirico on SR2 to the heart of Tuscany's hot springs, and there are several places to actually get in the natural thermal springs and relax the afternoon away. There are lots of charming towns to discover along the way take a detour if you have the time. Bagno Vignoni (SP323) is an easy drive down SR2. Bagno San Filippo is further down at exit SP61. SEE: At Bagno San Filippo, you can park along the hill at the top of town and walk down into the thermal springs and pools. It's a bit of a hike so wear comfy shoes. You can picnic here for the afternoon and lounge in the springs for free. Bagno Vignoni is famous for their 16th century "baths" in the public square which are spring fed from nearby Monte Amiata. The thermal water reaches temps of around 42°C (107 F) directly from the small town's volcanic springs and were used by the Romans and weary pilgrims who walked the Via Francigena from Rome. The spring in the town center is not open to the public but just steps away at Parco dei Mulini you can wade in for free. DRIVE: From Bagno Vignoni on SP323, take a right at Poggio Rosa onto SP55 in Monte Amiata. SEE: Here you'll find the Abbey Sant'Antimo, an historic Romanesque abbey in a scenic area with a bookstore open to the public. There's daily prayer with a number of prayer times, and it's amazing to visit while the monks are chanting. DRIVE: Next it's on to Montalcino for the day. SP55 (della Badia di Sant'Antimo) will take you right into the town of Montalcino. SEE: Park in the public lot below the town and spend time walking around this historic town. Montalcino has an impressive Museum, quaint shops and scenic views from the prime hilltop locatio. Grab an early dinner at one of the quaint restaurants with outdoor tables and order a glass or two of the DOCG wine Montalcino is known for - Brunello di Montalcino. DRIVE: From Montalcino, take SP14 toward SP2, the main highway to head back toward Montepulciano or wherever you're staying. Start this route near the south parking lot in Montepulciano. DRIVE: From Montepulciano, follow SP146 (di Chianciano) south of town. Turn off onto SP88 (Via della Montagna) and head toward the La Foce Estate. SEE: As you come into the narrow winding passage at Belvidere Piccolo, pull over and walk around the lovely medieval castle on the corner, Casteluccio al Foce. There's a WWII memorial on the wall where you can see the names of the local soldiers and residents (including 2 children) for whom this is dedicated. Just down the hill from this overlook you'll find one of the most sought after photo ops in Tuscany - the Strada di Valdoresi near La Foce. SP88 will end at the La Foce Estate, a private home, B&B, and lush Italianate gardens owned by the family of English writer Iris Origo, who wrote the book War in Val d’Orcia: An Italian War Diary 1943-44. The book tells the story of Tuscany during WWII when many local residents put their lives on the line to shelter escaped Allied prisoners and partisans in defiance of the Fascist regime. Definitely a must-read for interesting background before you visit the Val d'Orcia. Though the B&B is open for guests only, the La Foce gardens are open to the public on weekends. DRIVE: La Foce Estate sits at the intersection of SP88 and SP40. From here, head south on SP40 (Amiate-Chianciano) to SP53. Turn right onto SP53 and follow to another right onto SP18 (Monte-Amiata) toward Pienza. Before Pienza, turn right onto SP88 toward Montecchiello. SEE: Monticchiello is the quintessential Tuscan town, full of charm and friendly people. Similar to nearby La Foce Estate, the town has a inspiring past. During World War II, outspoken locals put their lives on the line by resisting the fascist efforts of Mussolini. Today, the town is equally vigilant in their efforts to preserve their history while welcoming the changing dynamics that come with increased tourism. If you can, try and visit during their annual theatre performance. People come from far and wide to see it. The story's been chronicled in a recent film about the townspeople and their theatre, called Spettacolo. Definitely a movie to watch before you come to this part of Italy, that will change the way you experience Monticchiello. Have a glass of local wine and a small plate at La Porta, a friendly spot on your left as you enter the town. It’s got a jaw dropping view over the valley from the upstairs terrace. DRIVE: TO CONTINUE TO PIENZA: Follow SP88 back out to SP18 and head north to Pienza. 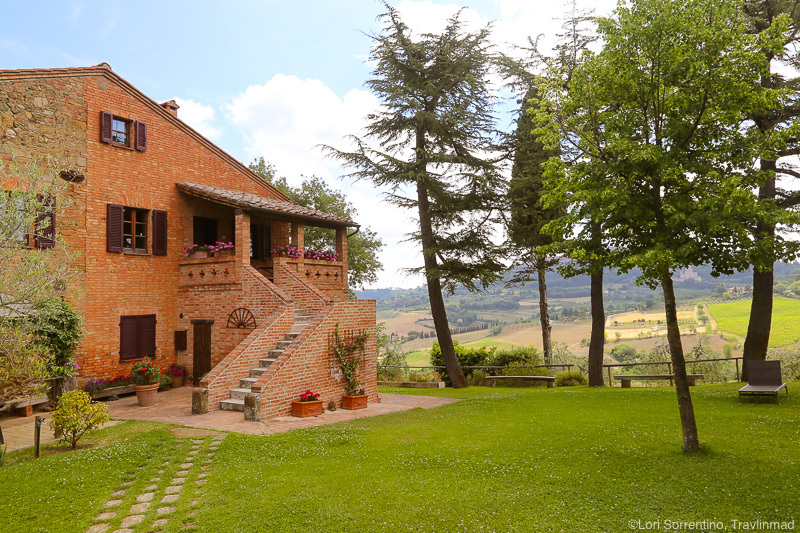 TO EXPLORE one of the most authentic maker of pecorino di Pienza cheese, Podere il Casale is really worth a visit. Follow the secondary road northwest from Monticchiello. You might feel lost, but you're heading straight to SP146, the main road between Pienza and Montepulciano. Ask for directions in town to the road that takes you to Podere il Casale. TIP: To help you find them, insert "Restaurant Podere Il Casale" in Google Maps. GPS: N 43 ° 4 '51 ", E 11 ° 42 '42 "
SEE: Podere il Casale, a local cheesemaking farm and restaurant just a few kilometers from Montecchiello, produces authentic local pecorino cheese on their farm. If you love slow food or slow travel experiences, this is a perfect stop for a cheese tasting and some wine. And the view overlooking the Val d'Orcia is incredible. DRIVE: Continue on the road drove from Montecchiello, which will lead you back to SP146. 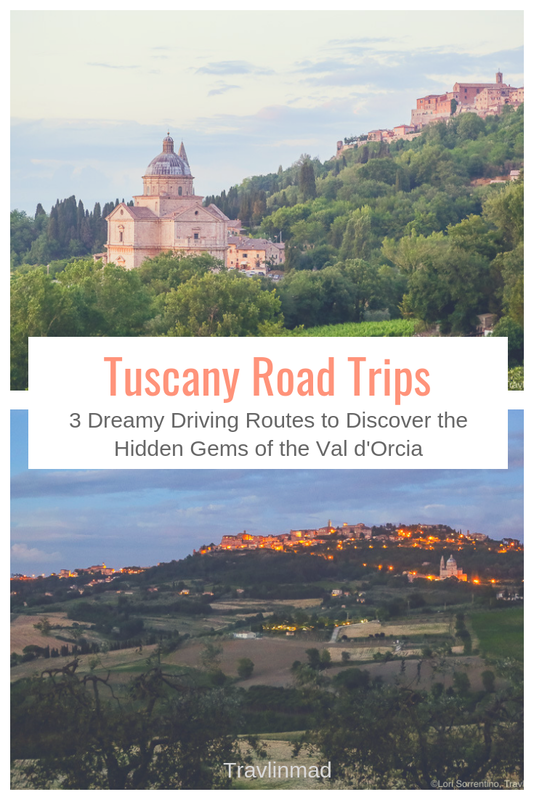 There are more than just these three Tuscany driving routes that will take you through the jaw dropping landscape you want to see, and we hope these give you a good start. But we hope you stay long enough to create your own! On our first trip to the Tuscany Val d'Orcia, by the time we happened upon the driveway that led us down to the Cugusi dairy farm, and their cheese, and the herd of sheep with all those tinkling bells, we were in love. On our next visit, I was determined to find a Tuscany agriturismo to stay in with that same amazing view. Thanks to Google Earth, we found Agriturismo Villa Mazzi, which was not only near Cugusi, it was practically next door. Not only did we love our stay here as you can read in our review, the location was perfect for driving the scenic roads of Tuscany and spending your day exploring the Val d'Orcia and Val di Chiana. And every night we couldn’t wait for the sheep to graze through! ;-) Check rates and availability at Villa Mazzi.